On April 15, 2013, I was sitting at my office which is about a half hour from Boston. My then fiancé (now husband) and I had spent the weekend looking at houses and had put an offer in on one the night before. Next thing I know, I get a call from him. He had been down cheering on people at the marathon. He was supposed to run it, but after beginning training found out that a knee injury he thought had healed required surgery. He was still down there cheering on his friends who were running. When I answered the phone, he told me that two bombs had gone off. He was fine, he was on the other side of the street, but he didn't know what he should do. Initially he wanted to go towards the bombs and help. I told him not to since it was not safe and he had zero medical training. I told him to go in the other direction. He decided to stay and look for his friend who was supposed to be close to the finish. We got off the phone and I tried to look up information on the bombings. Unfortunately, it was so new, most news sites didn't even have it listed. Twitter was where I was finding information, including the below picture. I left for home shortly after and waited to hear from him again. He eventually called and told me that he had found his friend and her mom and was headed to a T station from where they could get out of the city and I could pick them up. When I got them, I saw that he was wearing a white baseball cap. He almost never wears baseball caps. After getting everyone home I showed him the news that had started coming in, including the above photo. Do you see the guy on the right with the white cap? Apparently that was him and I had no idea at the time I found the picture. A year and a half later, he did run the marathon, as did his friend who was stopped, and we have gotten married and moved into the house we had put an offer on the day before all of this. So that was an incredibly long story to explain why I wanted to read this book. I did enjoy the book. Jeff Bauman was made famous by a picture (another one of the first ones I saw) of him being rushed away from the scene, missing his lower legs. The book tells a bit about his life before the bombs and his experiences during and after. From helping law enforcement by being able to identify one of the suspects, to figuring out how to be a public figure where who he talked to and took pictures with mattered, to relearning to walk, and dealing with his own depression. His girlfriend Erin's experiences stayed with me the most. She was the one running the marathon that Jeff and two of her friends were standing at the finish line cheering for. She hated all the public attention that she received after and appears to be a very private person. I do wish this book had been written later. The book does address that they wanted to get it out quickly while it was fresh in Jeff and the public's mind. But it ends abruptly about six months after the bombings and I am curious what is going on now. 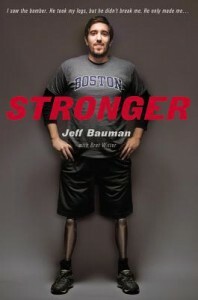 In the book Jeff talks a lot about wanting to be walking at the 2014 Boston Marathon and we don't get to see that. After writing that I googled to see if he was there walking and found out that since the book has come out, Erin is now his wife and they have a daughter. I honestly would have loved to read about some of those experiences and they would have benefited the book. Lionsgate is also developing a movie on his story so they may be adapted there. So it sounds like he is doing well which is great.